One of the few women writers published in the science fiction magazines of the 30s and through the Golden Age of 1938 to 1946, C.L. Moore said that she used her first initials (Catherine Lucille) to conceal her writing career from her employer, the Fletcher Trust Company. While she might have been brushing off the question, using her initials left readers thinking that she was a man. 1957 Galaxy Science Fiction Novel "Shambleau"
Moore's first sale as a professional writer was "Shambleau." Published in the Weird Tales November 1933 issue, it launched her career as a science fiction writer. While she was only paid $100 (a vast sum in the 1930s), the story has been reprinted in at least five anthologies. 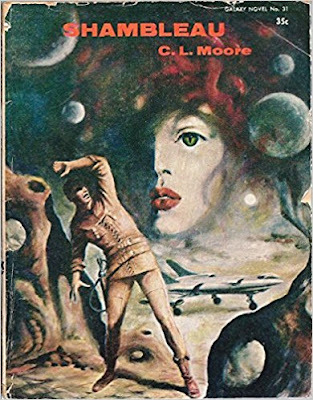 Moore wove together a tale of Martian smuggler Northwest Smith and his encounter with a lynch mob. The victim, an attractive, brown-skinned young woman, brings out his protective instincts and he claims her. (Northwest is also described as brown-skinned. An interesting choice for a story written in the 30s.) Although he later recognizes that "Shambleau" is not human, he takes her to his room anyway. The story pulls from Greek mythology, the old West and modern science fiction to build to its climactic finish. 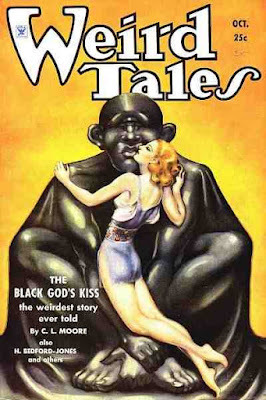 October 1934 Weird Tales "The Black God's Kiss"
Northwest Smith starred in several more stories, published in the April, May and August 1934 issues of Weird Tales. The October 1934 issue featured a new story and character – Jirel of Joiry – the female protagonist in a traditionally male domain, sword and sorcery. The same month, Moore's "The Bright Illusion" was published in Astounding Science Fiction. She continued writing stories for the magazine market through the 1930s. She corresponded with other writers and fans. In 1937, she wrote to L. Ron Hubbard: "And any technical advice you can give me will be deeply appreciated…. Anyhow, thanks a great deal for all the encouragement, and for liking my gilded-gingerbread style of writing." 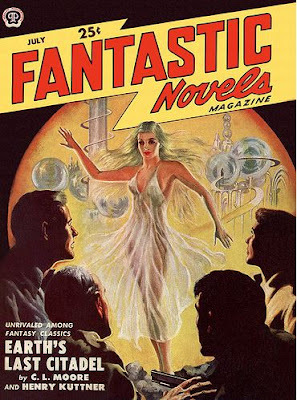 Galaxy Fantastic Novels "Earth's Last Citandel"
Ironically, her future husband and fellow science fiction writer Henry Kuttner wrote her a fan letter in 1936, thinking she was a man. They were married in 1940 and continued writing in collaboration, often under the pen name Lewis Padgett, which combined their mothers' maiden names. They published Earth's Last Citadel in 1943 under both their names. After Kuttner died in 1958, Moore's writing career slowed and after her marriage to Thomas Reggie in 1963, it ended. Moore participated in the Tom and Terri Pinckard Science Fiction literary salon and contributed to literary discussions with many noted science fiction authors. She was nominated as the first woman Grand Master of the Science Fiction Writers of America, but sadly, she had developed Alzheimer's. Her husband asked the SFWA to withdraw the nomination due to her condition. She died on April 4, 1987. Moore was inducted into the Science Fiction and Fantasy Hall of Fame in 1998.